St. Michael's Orthodox Church, consecrated October 14, l899, was the first permanent Ukrainian Orthodox church erected in Canada. Until the parish joined the Greek Orthodox Church of Canada in l922, it was served by a Russian Orthodox Mission. The church was built by immigrants from northern Bukovyna, now the western Ukraine, who settled in the Gardenton area after l896. Measuring 48' x 22' x 33', the structure exemplified Bukovynian pioneer craftsmanship in architecture, interior decoration and religious furnishing. 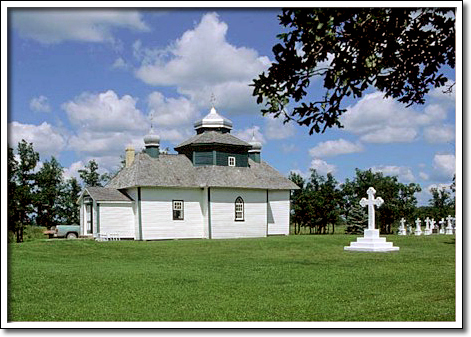 St. Michael's served as a focal point of spiritual and cultural life in the first Ukrainian settlement in Manitoba and remains a symbol of the continuity of the Ukrainian identity in Canada.